The Talmud states, “In a world that lacks humanity, be human.” In a world as untethered as ours has become, simply being human, a good person, is a measure of heroism. At a time when norms of civility are being routinely overwhelmed, it may be the only measure that matters. 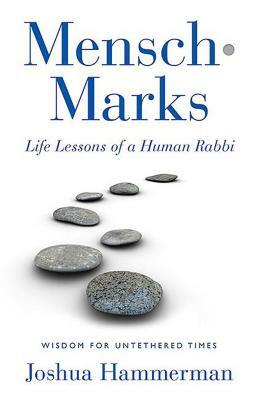 Mensch-Marks represents Rabbi Joshua Hammerman’s personal Torah scroll–the sacred text of his experiences, the life lessons he has learned along his winding, circuitous journey. Mirroring 42 steps Israel wandered in the Wilderness, Hammerman offers 42 brief essays, several of which first appeared in The New York Times Magazine, organized into categories of character, or “mensch-marks,” each one a stepping stone toward spiritual maturation. These essays span most of Rabbi Hammerman’s life, revealing how he has striven to be a “mensch,” a human of character, through every challenge.